Flambos Hot Mess is a new platformer adventure time game from cartoonnetwork. If you like games in which you have to go from point A to point B, avoiding pitfalls and under time pressure then this game will charge up your fun if not rage meter. Your general objective is to get into the end of each level as you collect jelly beans. However, platforms will burn out when you touch them so you better hurry up or you might end up bathing in the deep ocean which is very bad for you because your are Flambo. This game is nice, colorful and boy it gets hard when you get to higher levels. Planning your route though, may be the key to succeed in all levels. 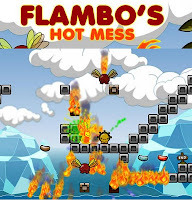 Meanwhile, here is Flambo's Hot Mess walkthrough guide for all 33 levels.